Metra says it has passed a major milestone with the completion of installation of a critical and expensive safety system designed to prevent deadly collisions and derailments. That system, known as Positive Train Control, or PTC, uses sophisticated satellite and GPS-based technology to allow computers aboard those trains to communicate with each other, with signals, and central command centers, preventing any two trains from being in the same place at the same time. PTC is also designed to stop trains from ignoring switches and speed limits, the cause of many deadly incidents, such as an Amtrak derailment last December near Tacoma which killed 3 people. On Monday, Metra marked a milestone with installation of PTC equipment in 528 vehicles, and another 240 trackside locations. The agency says it believes it will be fully operational with the safety system by 2020. But ever since it was mandated by Congress, PTC has been marred by controversy--primarily because of complexity and cost. 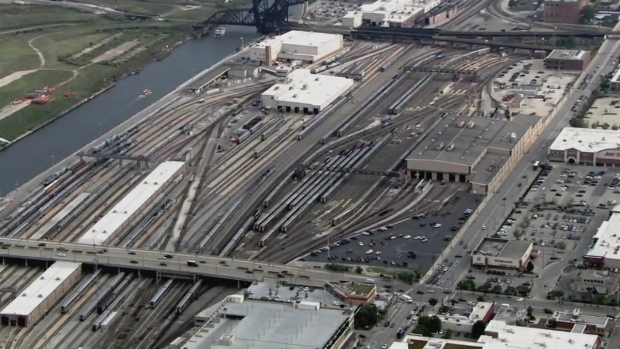 Here in Chicago, the nation’s most complex rail terminal, the price tag is expected to top $400 million. Sophisticated indeed. In the Chicago area, Metra’s trains must be able to communicate not only with each other, but with those on 13 other railroads. Each day, that means some 700 commuter trains will have to talk to another 700 freight and Amtrak trains. And if two trains come too close to each other, or a locomotive ignores a signal or upcoming switch, the system is designed to immediately bring that train to a stop. Nationwide, PTC installation will have to cover some 58,000 miles of track. In railroad terms, that task of making the brains of the trains talk to each other is called “interoperability”. Not all railroads contracted to use the same systems. But all have to be able to communicate, and its turned out to be a time-consuming venture to make that happen. Metra says the Burlington Northern line is up and running with PTC now---the reason BN commuters were hit with changes in their years-old schedules earlier this year. (PTC needs more time for trains to turn around, and that meant spacing out the BN timetables). The Union Pacific expects to be up and running with PTC in some form by year’s end.